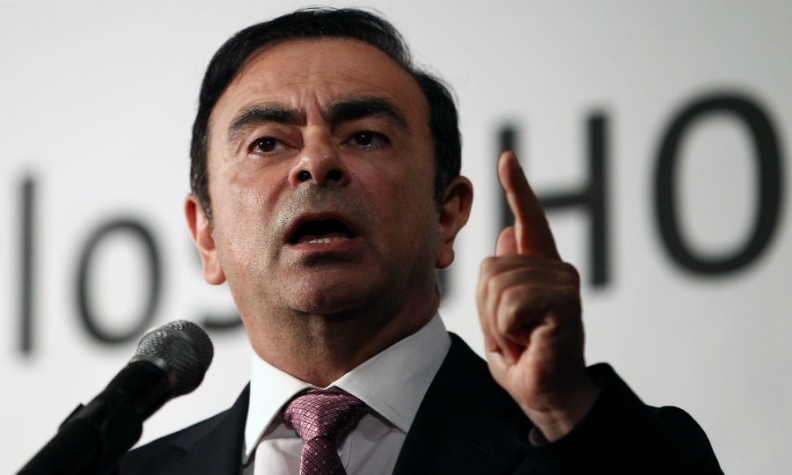 Ghosn: Self-driving cars "remain a long way from commercial reality." TOKYO -- Renault-Nissan CEO Carlos Ghosn, whose company made waves last year by pledging to develop autonomous cars by 2020, dialed back those expectations. Instead, he provided details for a new product pipeline, with more realistic targets. Nissan will deploy two new technologies -- a traffic-jam pilot and an automatic parking system -- by the end of 2016, and an automatic lane-changing feature in 2018, Ghosn said on Wednesday. That will be followed, by the end of the decade, by a smart-assist feature that will allow Nissan's cars to negotiate city intersections without driver intervention. But don't expect a car that will drive you to work while you sleep behind the wheel. Offering a stark reality check, Ghosn disabused the public of a notion that he may have helped foster. "Self-driving cars," he said in a speech at the Foreign Correspondents' Club of Japan, "remain a long way from commercial reality." "They are suitable only for tightly controlled road environments, at slow speeds, and face a regulatory minefield," he said. "That is why Nissan is focused on autonomous-drive technologies that we know will work, and can be introduced over the next four to five years." The distinctions spelled out by Ghosn reflect a more sober vision for autonomous cars than that conjured just a year ago. At the time, executives promised to have autonomous vehicles ready for sale in 2020, inspiring images of latte-sipping drivers reclined with their feet up. Nissan's announcement in August 2013 prompted a slew of me-too announcements from rivals such as General Motors and Tesla Motors. Now the tune has changed. "I want to clarify that there is a big difference between autonomous drive technology championed by Nissan, and self-driving cars," Ghosn said. "Autonomous drive is about relieving motorists of everyday tasks, particularly in congested or long-distance situations," he said. "The driver remains in control, at the wheel, of a car that is capable of doing more things automatically." That refined message cleaves closer to the industry's generally accepted forecast that fully self-driving cars are still far down the road. Instead, engineers, executives and regulators now see a range of increasingly sophisticated assisted-driving technologies that will evolve over the next five to 10 years, bringing cars incrementally closer to that goal. Nissan, which is seeking to rebrand itself as a technology innovator, wants to be a leader in introducing such features. Functions such as automatic parking, lane-change assist, automatic braking and the ability to creep autonomously through traffic jams are part of the strategy, as are zero emissions vehicles such as the Leaf electric car. Nissan's traffic-jam pilot, due by the end of 2016, will allow cars to drive autonomously on congested highways. In the same timeframe, Nissan says it will deploy its auto-parking feature across a wide range of vehicles. That will be followed in 2018 by a multiple-lane control function that will allow cars to autonomously dodge hazards and change lanes. An intersection navigator will debut by 2020. Nissan did not say in what vehicles the technologies would debut. "This technological momentum, in which cars will, step-by-step, offer more and more capability to assume journey-management from drivers, is a sign of things to come," Ghosn said. "Today, cars like the new Qashqai (sold in Europe) and new X-Trail have advanced park-assist systems," Ghosn said. "By 2017, we expect parking to be fully automated, and by 2019 increasingly remote -- so that cars can be parked in a controlled setting without a driver at the wheel." 4. Increased purchasing and decision-making power of female consumers. By next year, for example, Nissan will have "enhanced communications" functions loaded on 1.5 million vehicles, Ghosn said. The technologies include cloud-based systems to offer better access to social media, entertainment applications and voice recognition software. "Today, I have laid out the roadmap," Ghosn said. "We are actively preparing for these megatrends. And we intend to turn them to our advantage."